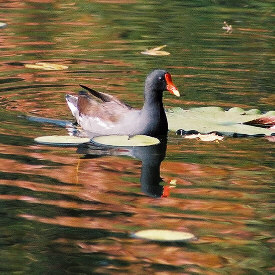 The common moorhen (Gallinula chloropusAnolis), a medium-sized water bird that nests on SRS, is a member of the rail family (Rallidae) and a relative of the coot. Unlike many of the rails, this bird usually is easy to see, feeding in open waters rather than in reedbeds. Moorhens have short, rounded wings and tend to be relatively weak fliers, although they're usually capable of covering long distances. They walk easily, on the other hand, as their strong legs combine with long toes to make them well adapted to soft, uneven surfaces. Moorhens are omnivorous, feeding on plant material, small animals, and eggs. They are aggressively territorial during the breeding season but generally can be found in sizeable flocks on the shallow, vegetated lakes they prefer. There are believed to be a few hundred moorhens at SRS. The 2006 SRS Environmental Report's interactive CD and associated web page were created by Marvin Stewart of the Washington Savannah River Company's Information Technology Department. The cover photograph was shot at the site's PAR Pond by Al Mamatey of the company’s Environmental Services Section. The cover was designed by Eleanor Justice of the Documentation and Information Services Section – Information Management and Program Support Group.